Danielle LaPorte knows how to work the word desire. Yes, the Buddhists are right: if we desire someone or something we cannot have, we will suffer. In another entirely different way, desire leads to liberation, fulfillment and happiness. LaPorte’s Desire Map project, with workshops and books, clarifies desire done right. It has been 21 days life-changing days since my Desire Map workshop with Laura Zera. I’ve done a lot of writing, thinking, and desire mapping. Getting clear with what I want the rest of my life to look like. Before I took this workshop, I was lost. I knew it. I’d been working my way up from hell for several months, but was still stuck in so many places. Enter Desire Mapping. Even the word “desire” freaked me out. Whatever I desired would automatically be denied, would lead to suffering, would hurt me by its utter absence from my life. Or so I believed. LaPorte does a different thing with desire. She keeps the luscious word but mixes it up with a few others to focus her idea about how to get happy, how to let go, how to feel free. I love the story at the beginning of the Desire Map book telling how LaPorte discovered this method of living life its highest potential. One New Year’s Eve, she was, as usual, making a list of goals. She had gotten good at this and had goals for several areas of her life: work, love, play. Somehow she didn’t feel so great as she filled out this goal worksheet. She had the feeling those goals would just get lost. She contemplated her feelings around goals. What if she just gave up setting goals? Her energy shot up. She felt lighter. Happier. She wanted to keep those feelings, but how to make them about her goals? She began to scribble down words on her worksheet, not goals but feeling words. She was on fire inspired about how she wanted to feel. Just reading, I got that fired up inspired, too. I knew joy and I knew sorrow and for sure preferred joy. I did not live in joy. Not most of the time. My feelings more often than not bossed me around, dictated I do what I did not want to do, rained on my parade, criticized and diminished me. I wanted to figure out how to stay in joy longer, and drop the despair. Could I put joy in charge of every action I took? Maybe I needed to give myself permission to desire again, to feel good, to dig deep for understanding about what I wanted and needed. It’s going to take more than 21 days, but I am well on my way, amazed that I am clear on how I want to feel, focused on doing the things that I know will get me there, letting everything else go. 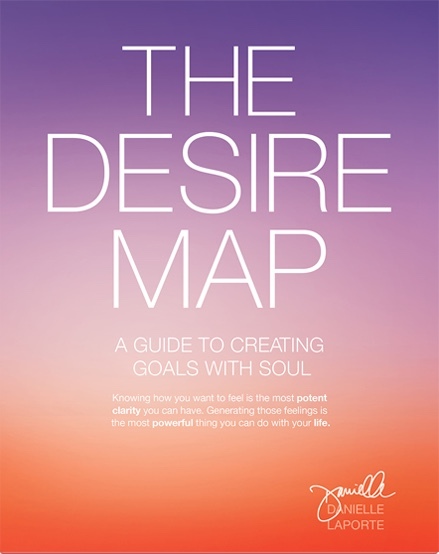 If you’d like to see your life sparkle again, the Desire Map might just be your way out of darkness, too. Beautiful, intense post. I don’t mean to pry but I would have valued an example or two of what you selected for your desire map. Such a life affirming concept thank you Cynthia! Hi Jackie. I thought about putting that in…I am trying to keep my posts to 500 words as I tend to go on and on, lol. I don’t mind sharing. I have been revising and reworking my Core Desired Feelings (CDFs) and right now they are “on fire intense” “content” “balance” “authentic” “love” and “present” … I generated hundreds of words in the past 21 days but these are the ones that resonate the most for me now. It’s always okay to change them, too. There’s a lot about this in the book, Jaye. You are supposed to choose words about what you want to feel, not what you want to get, or how you want others to make you feel, or what you want to change. Just “how do you want to feel?” That’s where you start. So instead of saying for example “loved” you say “love” because “loved” means you give that power to someone else…in order to be “loved” someone else has to do the loving, where “love” is something you can feel yourself. So it really does work, but you have to go about finding the right words and that actually takes some work. You know I recently hurt my knee. It’s been out of commission about as long as I’ve been doing the Desire Map. I want it to get better. I want to feel healthy and whole again. I want to climb a mountain on a Greek island. But the word “healthy” is not on my list…I don’t know why. I guess because “health” is not a feeling, it is a state of being. I could use “vibrant” “strong” “capable” ~ all those words are feelings I can access right now, even with the bum knee. I think I chose “content” to help me cope and accept that right now that knee is not perfect. So you can choose feeling words that help you get to the emotional place you need to be, if not the physical one. Does that make sense? And then based on wanting that feeling of being “content” I take the actions needed…calling doctors, getting tests done, and whatever comes next. And in the meantime I try not to stress. But it is difficult. I’m not so good at accepting this condition but I’m still hoping it will all be okay in the end. Just right now it is a pain! So I do know what you mean, and I wish you good luck. I think I am beginning to understand the theory behind all of this, the idea of concentrating on how you want to feel, opposed to what you want. It makes sense when you think of it that way. My ears perk up when I hear about the same thing from more than one person. My daughter shared a blog with me, in particular three posts that she thought I’d like. One mentioned Danielle Laporte and “The Desire Map” – here’s the link: http://www.shechanges.com/embracing-the-thrash/ My question has been what do I journal about? This approach is a new way to look at that. Oh good we can compare notes! I’m still reading the book and just adore it.